Yellowstone was the first national park in the world, and is known for its wildlife and its many geothermal features, especially Old Faithful Geyser, one of the most popular features in the park. 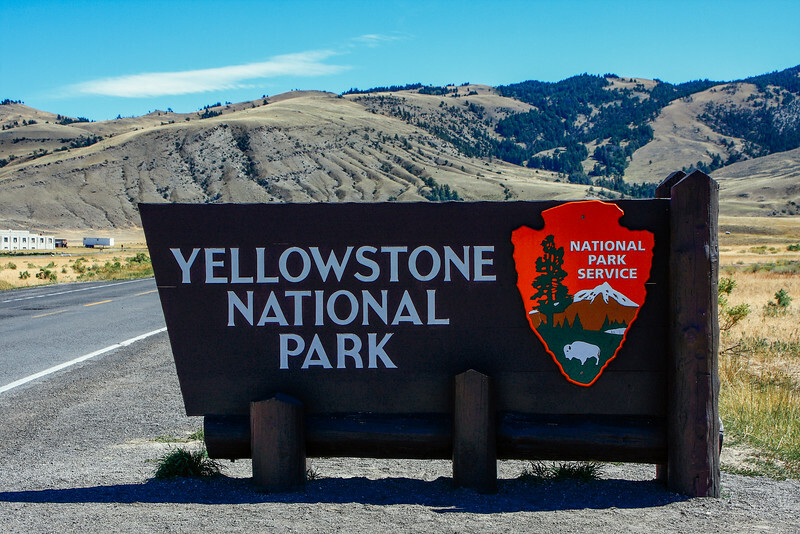 Yellowstone National Park spans an area of 3,468 square miles, comprising of lakes, canyons, rivers and mountain ranges. Yellowstone Lake is centered over the Yellowstone Caldera, the largest supervolcano on the continent. The caldera is considered an active volcano; it has erupted with tremendous force several times in the last two million years. Half of the world’s geothermal features are in Yellowstone, fueled by this ongoing volcanism. Yellowstone also is home to wildlife, especially the big 5. Moose, Elk, Bear, Bison and Wolves. Day 1: Beartooth Highway and The Grand Canyon Having flown into Billings, MT, the largest city in Montana, the previous night, we woke up early with a mission. Our night was spent at Days Inn, and we left even before the free breakfast time. Our morning started with the drive from Billings to Cooke City in Montana through the Beartooth mountains or the Absaroka Range. Some have called the Beartooth Highway the most scenic route in North America and until we see better we might have to agree. The road winds through the peaks at over 10,000 feet going through passes that are among the highest in North America. Steep rock faces, glistening lakes, snow covered peaks, winding mountain roads, are commonplace on this drive. The weather is the only constraint as the highway is closed from September to early May due to heavy snow. Going past Cooke City, we entered into Wyoming and the Yellowstone National Park. The northeast entrance opens up into the wide expanse of Lamar Valley, 8 miles long and 4 miles wide. The valley is lush, green and home to one of the largest bison population in the park. The bison at first far glance look like rock and at close they just look even more like big brown rocks. They weigh over 700 pounds and when they cross the road, everything else stops. The Lamar river waters the valley and the bison congregate on the banks. At the end of the valley is Tower Fall and the Roosevelt lodge. The Tower Fall is 132 feet of sheer drop and is accessible through a paved path. Roosevelt Lodge is a good rest stop with a visitor’s center, cabins and grocery stores. A few miles past the lodge is the Grand Canyon of the Yellowstone. The park gets its name from the yellow stone lining the walls of this canyon. Formed 650,000 years ago after a massive volcanic eruption, the canyon now offers some of the most striking views of the park. The Yellowstone river snakes its way through the canyon, forming multiple falls along the way, the most famous being the Lower and Upper falls. You can get to the brink of both the falls but it does require a short hike. We started with the South Rim, going past Uncle Tom’s lookout and then the Artist Point. We traced our way back to the North Rim, hiked to the brink of the Lower falls and then followed the one way road to Inspiration Point driving past the Glacial Boulder, a huge 500-ton rock carried to the spot by glacial movement over 15,000 years ago. The road then brings you back to the Canyon Village. A minimum of 2 hours is needed at the Canyon. As the day wore on, we drove to Norris, to the Norris Geyser basin, possibly the hottest geyser basin in the world. Temperatures at 1000 feet below have exceeded 450F. The waters at the basin are acidic due to the sulfuric acid. The basin is also the oldest active basin in the park having existed for over 115,000 years. There are trails through the basin leading you past many of the geysers and pools. The Steamboat Geyser, when it blows is the the largest. There are no predictable geysers at the basin so you have to be lucky to catch an eruption. We gathered the last light from the setting sun, captured it forever in our photographs and headed to West Yellowstone, through Madison for our night stay. Dinner was at Pete’s pasta and pizza and the night was spent at Best Western. Day 2: Basins, Lakes and Old Faithful: Another early day, again before we could do justice to the breakfast, we headed to catch the sunrise at the park. As we drove past Madison, we found the perfect stop. The Madison river flowing by, elks ready for their morning drink, the chilly air nipping at us, and the sun rise gloriously heralding another day with its uncountable colors. We stopped at the Fountain Paint pots and then headed to the Midway Geyser Basin. One of the most colorful basin areas in the park, the Grand Prismatic Spring throws any theories of colors you might have learnt out the window. Blue skies, green mountains and multi colored waters and soils. What is this alien land? Our day also started adventurously with a hike up the mountain to catch an aerial view of the spring. There were no paths but we carved our own through the trees. From the midway basin to the upper basin, and we were just in time to spot the Old Faithful hit full stride. Over 150 feet of hot, steamy jets jutting from the ground with a force that makes the earth tremble and we knew why this was the most visited spot. The geyser is the most predictable of all, with eruptions every 90 minutes. We grabbed brunch and headed for our trek through the most concentrated geyser basin in the world. Springs, pools and geysers of every color and shape dotted the landscape. we got word that the Grand Geyser, even bigger than Old Faithful was about to blow, it does every 12-14 hours, and we quickly headed to see the action. It didn’t and deciding to take our chance we headed to Morning Glory Pool. Now if you want one pool to just stare into and reflect at nature’s wonders this is it. 20 minutes later we were walking back and the Grand Geyser erupted. A quick run brought us back to it and when viewed against all the people in the foreground the height really stood out. We spent another 30 minutes winding past inactive geysers, silently churning underground and biding their time. Our next stop was the West Thumb basin area, the Yellowstone lake looks like a hand, and the views of the lake brought a whole new landscape to the park. Elk were nearby to keep the crowds occupied and the geysers again kept the landscape busy. Rounding the lake, we drove past Hayden Valley, another hot spot for wildlife. Bison again dominated the landscape. Our last stop for the day was the Mammoth Hot Springs, but a sudden snow storm turned our day into an adventure with slippery roads, near zero visibility and biting cold waves. That didn’t stop us, and we hiked the paths at Mammoth with a renewed love for nature. Hot water flowing on the grounds, steam rising through the snow flakes, the white limestone landscape whitened even more with the snow and us looking up and wondering if the earth and the universe was just one big snow globe. A feeling we will never forget. The day ended with a drive to Bozeman, MT through the north entrance of the park, past Gardiner and through the Absaroka mountains again. We drove back to West Yellowstone with a new car but very late at night, very low on energy but extremely high on adrenaline. Day 3: The Grand Tetons: If the Yellowstone is the world’s first National Park, the Grand Teton National Park is possibly the World’s most naturally gifted. The park is not large but what is has to offer is unbeatable. We started the day a little later at 9 and headed past the Kepler cascades and the Continental divide, Isa lake whose waters empty out to both the Atlantic and the Pacific and to the Grand Teton National Park through the South Entrance. The exploration of the Grand Tetons is easy, there is just one road that loops around the park. We started at Colter bay, a hike through the forest to the expanse of the Jackson Lake and the Grand Tetons formed a perfect backdrop to the lake. The Tetons comprise mainly of the Grand Teton peak (4197m) and Mt. Moran (3842m). There are also another 8 peaks that are over 12000 feet and form the Cathedral group of mountains. We took our car for a hike on the one way Signal Mountain road for even better views. We then headed to Jackson Lodge for our lunch and as we sat on the deck, 60 foot windows peering into the mountains on one side and the mountains on the other over the Willow flats, we realized that this might well be the most scenic place we have ever had lunch. No wonder Ansel Adams loved this place. We drove past Jenny Lake, stopping at various lookouts and ended the first leg of the loop at Moose Junction. Appropriately named, as the first thing we saw was a pile up of cars due to a Moose spotting. A male moose had made the stream its home and a herd of females were vying for its attention. One made its move, and soon the male Moose was howling with excitement. We saw it all. We shifted gears and started to follow the Snake river back up north. As the road sped past Snake River, we stopped every few miles to take in the breathtaking views of the Grand Teton Mountains and the Snake River slowly carving its way from them. 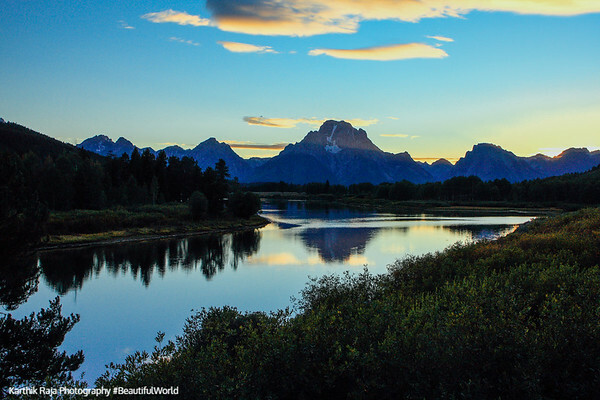 The evening ended with a stop at Oxbow bend for the sunset, but the grandeur of the Tetons also had its disadvantages and didn’t let the rays or the colors of the sun shine through. It was nevertheless a stunning sunset, only one in monochrome. Unfortunately we also missed a Grizzly bear by just over 10 minutes, as one had sauntered past oxbow bend before we arrived. We then drove to Leeks Harbour for their famous pizza but again we were a few minutes late as Leeks closed for the season that day and were all out of fresh dough. We had to settle for pasta and sandwiches for dinner. The 2 hour drive back to West Yellowstone was dark but thought provoking as we were enveloped by a billion stars. A quick stop with the lights off confirmed our fears that somehow even though all signs point to us being alone in this world, we aren’t. There just isn’t any way that all those shinning flickering stars don’t harbor a living being. Day 4: North to North East Yellowstone: Our last day at the Park, we slowly headed out to Mammoth Springs. As out of this world at is was 2 days earlier, the springs in broad daylight emphasized the varying landscapes of the Yellowstone National Park. We then proceeded east towards Roosevelt, covering the parts of the park we hadn’t yet. We stopped at the Petrified Tree, the tree that has been fossilized for the last 15 million years. We stopped at Undine falls, to catch a last glimpse of the water through the park and ended our park vacation with a breath stop at the Blacktail pond. This is as close to paradise as we can get on Earth.